Secured credit cards may not sound like any credit card that you would want to have when you realize that it is your own money that is funding the card. However, if your credit history involves bankruptcy or charge offs of credit cards then a secured credit card might be just what you need to work on repairing your credit history. When you apply for a secured credit card you are asked to make an initial deposit to fund the card. If you make the deposit and then make your payments on time it is possible you will see your credit number rise and the card issuer may offer you an unsecured card. Look for a card that doesn’t require you to put down a large deposit to open the account. Most secured cards require deposits in the $300 range. You also want to make sure that the credit card issuer reports your credit transactions to the three major credit reporting agencies. Since you are spending your own money with a secured card try and find a card that does not charge exorbitant fees. Make sure to read all the fine print. Here is a short list of some of the secured credit cards that are available to choose from. Platinum Zero Secured Visa credit card. 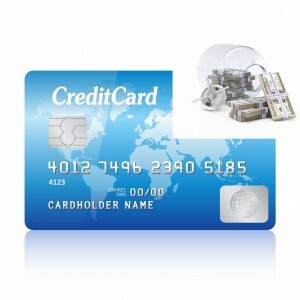 This secured credit card is available through Applied Bank. Applied Bank does not charge any interest or 0% APR for any charges that you might make with the card. On the down side there is a monthly maintenance fee of $9.95. Depending on how much you deposit the credit line can be from $500 to $5,000. Citi Secured MasterCard. You get the brand power of Citi with this secured card. You also get a high interest rate of 18.24%. There are no monthly fees with this card but there is a annual fee of $29.00. What is most important with this card is that if you maintain a good credit history with Citi using their secured card they are likely to offer you a unsecured line of credit. Applied Bank Secured Visa Gold credit card. This card is similar to the other Applied Bank but card but there is no monthly maintenance fee or annual fee. The interest rate is a fixed 9.9% APR and based on what you deposit the credit limit is $200 to $5,000. Capital One Secured MasterCard credit card. The APR for the Capital One Secured MasterCard credit card is high at 22.9% annually. There is also a annual fee of $29.00. Capital One does allow you to upgrade your secured card to an unsecured card with proven financial responsible use of the card. Secured credit cards are credit cards “secured” by a deposit savings account. Also known as bank secured credit cards, a secured credit card holder would simply deposit a required amount into an account known as a collateral savings account with the bank or credit card issuer. The bank or issuer would then grant the cardholder the amount of credit equal to the amount deposited in the collateral savings account. While secured credit cards require a security deposit and/or additional fees, in most cases approval is guaranteed and you get a credit card and no credit check. The best secured credit cards are those that report to the major credit reporting agencies. This is because the reporting of your on-time payments to those agencies is what improves your credit rating.